to comiXology fans around the globe. 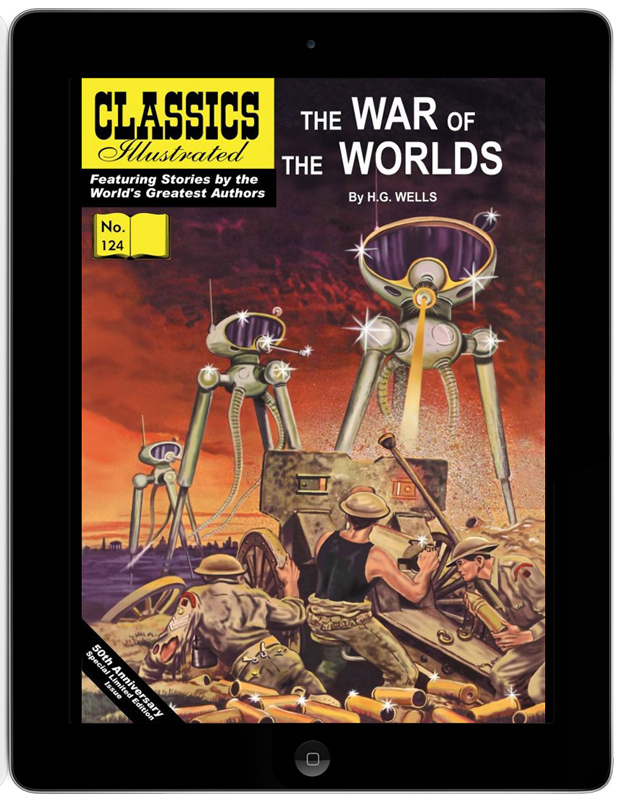 One of the well-known brands in the comic book publishing arena, The Classics Illustrated line consists of illustrated adaptations of traditional literature, non-fiction and biographies featuring the world's greatest stories by the worlds greatest authors including: Charles Dickens, William Shakespeare, Victor Hugo, H.G. Wells, Jules Verne, The Last of the Mohicans, War of the Worlds, The Pearl Princess, Treasure Island, The Count of Monte Cristo, Robin Hood, Snow White, Jane Eyre, The Three Musketeers and over one hundred more. , iPad, Android, Kindle Fire, Windows 8, and the Web – making it the best digital platform for comic and graphic novel fans worldwide. Winter/spring lecture series The American New Wave (begins January 24) with weekly Tuesday lectures by Bruce Jenkins, professor at SAIC and author of books on Gordon Matta-Clark, Hollis Frampton, and Bruce Conner. This series looks at the movement which included such artists and filmmakers as John Cassavetes, Robert Frank, and Shirley Clarke. Stranger Than Fiction: Documentary Premieres (January 4-February 6) features footage of staged readings of teenage diaries in Mortified Nation, the excesses of Western culture in Propaganda, the history of an American phenomenon in The Harvey Girls: Opportunity Bound, Chicago ties to the Holocaust in A Song for You, a portrait of Chicago jazz artist Kahil El’Zabar in Be Known, a young family man’s devastating struggles in I Am Breathing, and a reclusive Scottish fly fisher in Kiss the Water. 17th Annual European Union Film Festival (March 7-April 3) is the nation’s largest film showcase of European Union (EU) nations. Greece is in the presidency of the EU and will host opening night—movie TBA. Films secured to-date are The Eternal Return of Antionis Paraskevas (Greece), about the mysterious disappearance of a popular talk-show host; Marius and Fanny (France), new screen adaptations of Marcel Pagnol’s classics, starring and directed by Daniel Auteuil; Exhibition (United Kingdom), about a London couple whose marriage is on the rocks except in the bedroom; Child’s Pose (Romania), about an unhealthy mother-son relationship; and Dream Team (Latvia), centering on the country’s quest for a basketball championship in the 1930s. Chicago premiere! Two week run! Following the Ninth: In the Footsteps of Beethoven’s Final Symphony (December 20-January 2) looks at how the 180 year-old “Ode to Joy” finale in Beethoven’s Ninth Symphony has transcended symphony halls to become the rallying anthem of struggling and oppressed people around the globe, examining its hopeful melody and inspiring words’ artistic, cultural, and political impact across five continents and 10 countries. Repertory: pairings of the following films: Fritz Lang’s Woman in the Window and Gene Kelly in Christmas Holiday; Buster Keaton in Sherlock, Jr. and Charlie Chaplin in City Lights; Peter Sellers-Blake Edwards comedy double-header The Party and A Shot in the Dark; and Ray Harryhausen fantasy classics Jason and the Argonauts and The 7th Voyage of Sinbad. Buy a ticket to both movies in the pair and save—see discount information below. Lecture series discount! Gene Siskel Film Center members pay discounted admission of $5 to any screening in the series Public Enemies: The Gangster/Crime Film. Northwest Chicago Film Society Pass! Seven Northwest Chicago Film Society movies for less than the price of five. Turn in your pass at the end of the series of a $5 discount on a Gene Siskel Film Center membership. An $82 value for $50! Families in Chicago can take a break from holiday shopping and get free family photos inspired by TV’s funniest family with USA Network’s MODERN FAMILY Pop-Up Photo Studio. MODERN FAMILY fanatics, otherwise known as “MOFYs” (“Make Our Family Yours”), will have the opportunity to pose for free photos with show-inspired props including cardboard cutouts of cast members at malls in key cities across the country. Families will receive a print out of their photo and the images will also be transformed into a custom-animated MODERN FAMILY-themed GIF, shareable across e-mail, text, and social media from tablets within the studio. The MODERN FAMILY Pop-Up Photo Studio is visiting multiple cities including Atlanta, Philadelphia and Boston. or within the USA Anywhere App as well as inside a number of Social TV apps including NextGuide, Shazam, Viggle and zeebox. MODERN FAMILY is produced by Twentieth Century Fox Television in association with Picador Productions and Steven Levitan Productions, stars Ed O’Neill, Sofia Vergara, Julie Bowen, Ty Burrell, Eric Stonestreet, Jesse Tyler Ferguson, Sarah Hyland, Ariel Winter, Nolan Gould and Rico Rodriguez. Steven Levitan and Christopher Lloyd are creators/executive producers. Danny Zucker, Dan O’Shannon, Bill Wrubel, Paul Corrigan, Brad Walsh, Abraham Higginbotham and Jeffrey Richman also serve as executive producers. The #1 network in all of basic cable for an unprecedented seven straight years, USA Network is seen in over 102 million U.S. homes. USA is a leader in scripted programming with a powerful stable of originals, spectacular live television and is home to the best in blockbuster theatrical films, a broad portfolio of acquired series and entertainment events. A trailblazer in digital innovation and storytelling, USA is defining, driving and setting the industry standard for Social TV. USA is a program service of NBCUniversal Cable Entertainment, a division of NBCUniversal. The award-winning website is located at www.usanetwork.com. Characters Welcome. Parents looking for something to keep their youngsters on their toes this holiday season should look no further than the annual Dance-Along Nutcracker® event presented by the Department of Cultural Affairs and Special Events, Sunday, December 1 at the Chicago Cultural Center (78 E. Washington St.). The FREE performances are noon and 3 p.m. under the Tiffany-stained glass dome of Preston Bradley Hall (third floor). One hour before each performance, at 11 a.m. and 2 p.m., in the fifth floor Washington Room of the Cultural Center, ARCC Ballet (Art Reaching Children of Chicago) will teach basic ballet positions and movements. Founded in 2005 by Jennifer Minkin, ARCC Ballet and ARCC Academy offer dance instruction, performance opportunities and workshops for children and adults. ARCC Ballet also offers after school dance programs to over 25 day schools throughout the Chicagoland area. Then the real fun begins when performers of all ages and abilities are invited to dance along to the familiar music of Tchaikovsky’s holiday classic with professional dancers from Ballet Chicago. Ballet Chicago’s mission is to advance American classicism in ballet by presenting inspirational and unique ballet performances to a wide audience. Music for the Dance-Along Nutcracker® is provided by the Lakeside Pride Symphonic Band. Lakeside Price Music Ensembles reflects a legacy of bringing members and friends of the lesbian, gay, bisexual and transgender (LGBT) community together through music for more than 30 years. Each performance by one of its four major ensembles – marching band, jazz band, symphonic band and symphony orchestra – enables Lakeside Pride to connect with audiences everywhere. Additional information, including how to join an ensemble, is available at lakesidepride.org. The Dance-Along Nutcracker®, created in 1985, is the property of the San Francisco Lesbian/Gay Freedom Band, the world’s first openly gay musical organization. Any use of the name, concept or imagery without the written permission of SFLGFB is prohibited. More information is available at www.sflgfb.org. For more information about the Dance-Along Nutcracker® and all arts programming at the Chicago Cultural Center presented by the Department of Cultural Affairs and Special Events, visit chicagoculturalcenter.org or join the conversation on Facebook and Twitter, @ChiCulturCenter. In the spirit of Thanksgiving this month, we would like to express our gratitude to all of our clients' and friends' support this year. The diversity of the services we offer combined with the strength of our expert staff have all contributed to The Conservation Center's success over the past three decades. For us, every project big or small represents the fine art of art conservation. We are also especially excited for our latest achievement: a prestigious client services award presented to us recently by the Family Wealth Alliance. In addition, for the first time in The Center's history, a new VP of Marketing and Communications has joined the team this month. We continue to strive every day to remain on the forefront of our field. The First National Bank of LaGrange (FNBLG) recently brought its Presidential Check Collection--one of the most comprehensive in the country--to The Center for conservation. This assemblage of checks written by 39 of the 43 U.S. presidents captures a unique piece of the American history and gives a glimpse back into the chief executives' professional and private financial lives. The Conservation Center is thrilled to welcome Chai Lee, Vice President of Marketing and Communications, to its senior management team. Chai took up this newly created role on November 1 and is responsible for leading The Center's marketing and communications functions--which includes brand development, press relations, advertising, digital marketing, and social media. Last month, the Family Wealth Alliance (FWA)--an independent and objective resource to high net worth private families and the firms that serve them--awarded The Conservation Center with a Best of the Decade award for Outstanding Client Experience. We're absolutely honored to receive this accolade and many thanks to FWA for the recognition! As the destructive Hurricane Sandy approached New York City in late October 2012, the residents and businesses in Manhattan's low-lying areas--including Chelsea, home to one of the world's largest concentrations of contemporary art galleries--were ordered to evacuate. Now, one year later, many works of art are still being restored. The Conservation Center was on the ground during the disaster last year and brought about 600 pieces back to Chicago for treatment. Heather Becker talked to Claims Journal last month, where she commented on The Center's crucial role in New York City's art scene. The Conservation Center is pleased to participate in the PLBR Large Loss Conference this year, taking place from November 18-20 in Jacksonville, Florida. Heather Becker will be joined by Gail C. Momjian, Senior Personal Property Specialist III, Liberty Mutual Insurance, and Richard Berberian, President, Guaranty Jewelry Replacement, Inc., to conduct a personal property claims challenges session with conference participants. We look forward to seeing you there! PLRB members: visit the PLRB/LIRB Distance Learning Modules page and take The Center's Continual Education Module: Two-Dimensional Fine Art Claims. MRS. GREEN’S NATURAL MARKET OPENS ITS FIRST CHICAGO LOCATION! On Friday, November 15, one of the East Coast’s leading organic grocers is opening its first Midwest store in Chicago’s vibrant Lincoln Park neighborhood. Mrs. Green’s Natural Market (555 West Webster at the intersection of Lincoln and Webster) will offer “clean” eating options for consumers seeking locally-sourced organic products including fresh produce, meats and dairy, artisanal baked goods, supplements and much more. With two full-time registered dieticians on staff, Mrs. Green’s mission is not only to sell exceptional organic and health-focused products, but to also educate and inspire its customers to eat and live well, which is apparent in every corner of the store. With aisles dedicated to a fabulous assortment of natural and organic products, shoppers can browse thousands of products from leading brands and also receive guidance from professionals trained to promote healthy eating by answering customer questions and supporting individuals' diet needs. Mrs. Green’s also plans to host a series of free healthy eating events and classes throughout the year. The store also features grab-and-go food stations, featuring health-focused, delicious options for lunch and dinner, including Neapolitan pizzas, burgers, barbeque rotisserie, a salad bar featuring 100% organic produce, sushi, soups, burritos, fresh deli sandwiches and fish tacos made-to-order from the daily seafood selections. Shoppers also can purchase fresh squeezed juices, smoothies and coffee. Mrs. Green’s currently has 13 locations on the East Coast, but plans to expand throughout the Chicagoland area in 2014. As the company opens stores throughout Chicago, each store plans to become heavily involved in local charitable efforts and community programs. In the new Lincoln Park location, the store will feature artwork from local artists and highlight shoppers of the month. Mrs. Green’s Natural Market is a subsidiary of Natural Markets Food Group (NMFG), which is a privately owned business that consists of retail food stores and food service restaurants. The company operates over thirty location in the US and Canada. 4U Brite Lites_Gift City” to Open Friday at Nordstrom Michigan Avenue in Chicago! On November 15th, the ongoing series ‘Pop-In @ Nordstrom’ continues with the launch of holiday shop “4U: Brite Lites_Gift City”, located in 12 Nordstrom stores and online at nordstrom.com. Showcasing a selection of gifts perfect for the person who has everything, “4U: Brite Lites_Gift City” features extraordinary gifts in price points running the gamut from stocking-worthy tchotchkes to indulgent designer exclusives. As part of the Pop-In project, Nordstrom partnered with RxArt, a non-profit organization that transforms pediatric hospital facilities into comforting and engaging spaces through site-specific installations by contemporary artists. The organizations collaborated to create exclusive giftables including mugs, notebooks, t-shirts, lollipops, and car freshener-shaped ornaments featuring prints from notable artists Ryan McGinley, Nate Lowman, Julia Chiang, José Parla, Andrew Kuo. Each Pop-In @Nordstrom is curated and organized by Olivia Kim, Nordstrom Director of Creative Projects. With each new theme, Kim directs the design and assembly of the in-store installation featuring her coolest finds, including exclusive and limited-edition items. To design the pop-up installation of “4U: Bright Lites_Gift City,” Kim again turned to Rafael de Cárdenas Ltd. / Architecture at Large, a commercial and residential architecture and design firm known for its fully immersive environments. The designer sampled from the industrial domain and worked with standard materials in an intricate manner to design the gift shop, calling it a “cabinet of curiosities” and using colored fluorescent lights and acrylic mirrors to enhance select items for closer examination. The installation is wrapped in a skin of metal shelving and chain-link fence, with gifts distributed evenly to create a graphic arrangement. “This is what I’d like Santa’s workshop to look like,” said de Cárdenas. THE TONY AWARD®- WINNING “CRITICS’ PICK” MUSICAL SMASH COMES TO CHICAGO DECEMBER 2014! CHICAGO (November 13, 2013) – Broadway In Chicago is thrilled to announce that NEWSIES, the Tony Award-winning “critics’ pick” Broadway musical smash, will play the Bank of America Theatre (18 W Monroe) Dec. 10, 2014 through Jan. 4, 2015. NEWSIES will be part of the Broadway In Chicago 2014 Fall Season. Group tickets for 10 or more are now on sale by calling Broadway In Chicago Group Sales at (312) 977-1710. Individual tickets for NEWSIES will go on sale at a later date. For more information, visit www.BroadwayInChicago.com or NewsiesTheMusical.com/Tour. For information or to register for advance ticket access notifications, visit NewsiesTheMusical.com/Tour, Facebook.com/Newsies and Twitter.com/Newsies. NEWSIES features a Tony Award-winning score with music by eight-time Academy Award® winner Alan Menken and lyrics by Jack Feldman, with a book by four-time Tony Award winner Harvey Fierstein. Produced by Disney Theatrical Productions, NEWSIES is directed by Tony nominee Jeff Calhoun and choreographed by Christopher Gattelli, who won a 2012 Tony Award for his work. NEWSIES has consistently exceeded expectations since premiering on Broadway at The Nederlander Theatre in March 2012. Originally transferred to Broadway as a limited engagement of a few dozen performances, the breakout hit is now approaching its 700th performance. In a remarkable demonstration of the breadth of the title’s appeal, ticket orders had arrived from all 50 states within weeks of its first Broadway performance in 2012. Since then, NEWSIES has set and broken seven Nederlander Theatre house records and become the biggest hit of the 2011-12 season. When NEWSIES premiered at Paper Mill Playhouse in Millburn, NJ it engendered extraordinary interest from the media and public alike, prompting Newsweek.com to call the show, "one of the biggest surprises of the season...the talk of the town." NEWSIES will be part of the Broadway In Chicago 2014 Fall Season. Group tickets for 10 or more are now on sale by calling Broadway In Chicago Group Sales at (312) 977-1710. Individual tickets for NEWSIES will go on sale at a later date. For more information, visit www.BroadwayInChicago.com or NewsiesTheMusical.com/Tour. Songs To Make Dogs Happy for Christmas! Today Is Your Lucky Day to Be in Chicago!